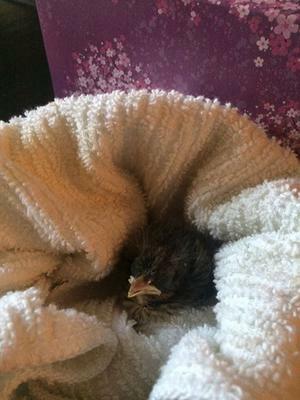 Peter G sent us these pictures of a little lost chick he found in his yard. There are no parents around and he can't see a nest where this little bird may have fallen from. 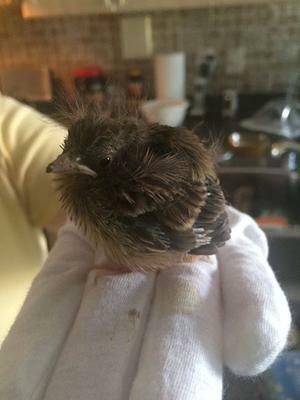 Do any of our readers know what kind of bird this might be, and if you do, what should it be eating. Please let us know by sending a comment below. It looks like it may be a baby robin. If so, I have raised them in the past. They love blueberries and I fed my babies Cesar's dog food. Don't give them worms at this point. They can be toxic if not first chewed up by Mom or Dad. I would want to make sure that Mom or Dad is really not around before I tried to raise him though. It's a bit hard to tell by the photos, but I'm guessing maybe a baby crow. They eat unsalted peanuts, sunflower seeds, fresh fruit, crickets & mealworms. Hi, That must be a chick of American Robin. Even otherwise also, it would eat earth-worm. Try that.